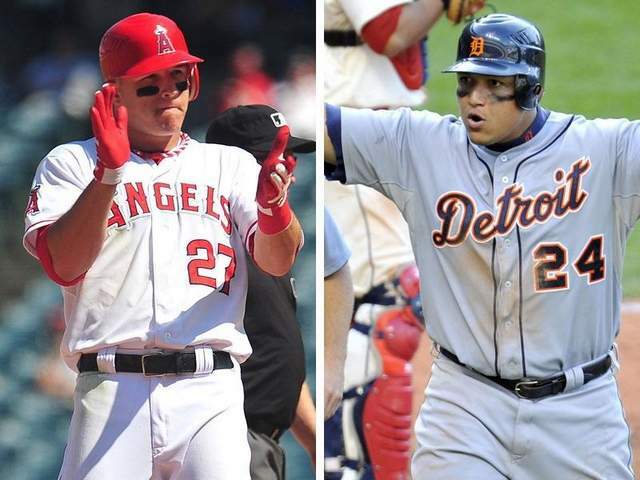 MVP Race: Mike Trout or Miguel Cabrera? One of the more interesting debates on the diamond this season is the AL MVP. This season, Angels’ rookie Mike Trout and the Tigers’ Miguel Cabrera compiled two of the best seasons in baseball history, leaving baseball writers perplexed when it comes to voting for the title. My Daily Illini colleague Stephen Bourbon and I break down the race below, beginning with my argument for Trout after the jump. In 100 years, historians may look back at the 2012 MLB season as one of the most statically astonishing years of all time. Seriously, a rookie is on the verge of beating out a Triple Crown winner for the American League MVP award. How bizarre is that? While the topic is hotly debated, the choice of the Angels’ Mike Trout for the award is a little more clear-cut than what it seems to be. The Tigers’ Miguel Cabrera had a fantastic season, batting .330 with 44 home runs and 139 RBIs to lead the AL, but Trout’s numbers are within reach despite playing 22 fewer games. He hit .326 and 30 home runs with 83 RBIs. Trout excelled in equally important stats such as stolen bases (Trout had 49 while Cabrera had four), triples (eight to zero) and, most importantly, defense. But those numbers don’t give an accurate evaluation of how great each player was to his team. Sabermetrics provide this insight, and I’ll explain the only one that really matters: wRC+. This stat shows how many runs a player created for his team relative to the league average, adjusted to teams in the league as well as ballparks. Therefore, this stat takes into account the value of different types of hits as well as stolen bases. For example, a home run is measured as a little over two times the value of a single. And the league average of this stat stands at 100. So Trout, who has a wRC+ of 175, has created 75 percent more runs than the average center fielder. Cabrera, on the other hand, has a wRC+ of 166, signaling that Trout is the more efficient offensive player. The argument for defensive value doesn’t even need to be made. If you watched “SportsCenter’s” Top 10 at all this year, chances are you saw Trout climbing the outfield wall to save a run or two or stretching out to make a ludicrous diving catch in center field. Cabrera was an above-average defender at third base, but even his biggest fan couldn’t make a sensible argument when it comes down to fielding. Cabrera’s backers contend that team success is what catapults the Detroit third baseman to the league’s MVP award. Yes, Cabrera’s team did reach the playoffs while Trout’s did not, but is it really fair to penalize Trout for playing in a significantly better division? After all, the Tigers didn’t even manage to finish with a better record (88-74) than the Angels (89-73) despite playing in a much weaker division. Additionally, Los Angeles compiled a measly 6-14 record before Trout made his season debut. Once he joined the team, the Angels went 82-57, the best record in the AL from mid-April on. Winning the Triple Crown is quite an accomplishment, but nine players have done so since baseball established the MVP award in 1931. Trout, however, is the first player in history to hit 30 homers, steal 45 bases and score 125 runs. In under 140 games, no less. Miguel Cabrera is the rightful AL MVP, and it’s not even close. The reasoning behind that conclusion can be summed up in just three words: Triple Crown winner. The Triple Crown is the holy grail of goals for all hitters but hadn’t been achieved in 45 years, compared to the nine winners in the 45 years from 1922 to 1967. If we were back in the heyday of Triple Crown winners, then maybe this achievement wouldn’t mean as much. And there could be an argument made for Mike Trout of the Angels, or even Robinson Cano of the Yankees. But the fact that the summit hasn’t been reached in so long would make it an atrocity not to give the MVP to Cabrera. Not only was he first in the AL for batting average (.330), home runs (44) and RBI (139), but the Tigers’ slugger was first in OPS (.999) and slugging percentage (.606), while finishing second in runs scored, only behind Trout. Cabrera was a model of consistency, playing in all but one game and posted one of the greatest seasons in the post-Balco era. But if sheer numbers don’t sell you, intangibles only add to Cabrera’s right to the trophy. When the Tigers made a splash last offseason and signed first baseman Prince Fielder, the incumbent Cabrera agreed to switch back to third base, a position he hadn’t played since 2008. He performed admirably back in the hot corner, committing the fourth-least errors among third basemen in the American League. In terms of the literal meaning of most valuable player, Cabrera provided the spark the Tigers needed to make a charge in September to pass the White Sox for the AL Central title. In comparison, Trout’s Angels finished third in the AL West, underwhelming for much of the year. Trout might not even be the MVP on his own team, with Albert Pujols, Jared Weaver and Mark Trumbo also boasting impressive resumes. When you can’t definitively point out Trout to be the most valuable player on his team, it’s hard to think he should be the most valuable player of the league. The last three Triple Crown winners— Carl Yastrzemski in 1967, Frank Robinson in 1966 and Mickey Mantle in 1956 — all earned MVP honors in their respective seasons. Robinson and Mantle were unanimous choices, while Yastrzemski earned all but one first-place vote. This shows clear precedent among the voters that Cabrera should and will walk away with the trophy when the time comes. Trout gets the interest appeal because he’s only 21 years old and has been proclaimed to be the next Mantle by baseball pundits across the country. Don’t get me wrong, Trout will get hardware this winter: Rookie of the Year. But let’s not let his potential and his story rob the more deserving player. Who did you think had the better argument?